A Few Different Dynamics of Travel within Round Two. 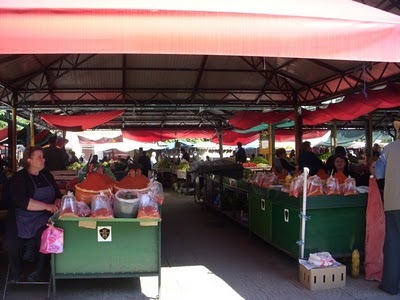 Today I am in Bitola, a charming town, I will have a post up soon. I got a great deal on the hotel, regular 35 Euro, I got it for 15 Euro, I am staying two or three nights. Traveling Macedonia is very pleasant, I am surprised that more travelers don’t visit this region of the world; the Balkans are truly beautiful. Yet, there is really only one big tourist town that everyone talks about, and that is Ohrid. So, of course, Ohrid is one of my last stops. It is interesting to follow different one-year travelers, in addition to long term travelers. Many visit the same popular sites and choose similar travel routes; however, this can help to understand what areas to avoid or to visit last. There are several dynamics that I have recognized that are differences from Bulgaria. First the Macedonians have good taste in music, rarely have I heard that repetitious tech-no music that they play all over Bulgaria. Interesting enough, there are many men that were small ear rings in both ears, and mostly the same style ring; a very rare site in Bulgaria, and if so, only in the city. The time of Macedonia is at GMT -1, so I did gain an hour, but didn’t figure that out four days later, it didn’t ring a bell leaving Skopje one hour late according to my clock, but at the second bus station in Negotino I changed my clock. I kind of loose track of time; this last winter I was losing track of the days. There are a few different dynamics this time actively traveling. First, my body feels much stronger, and it is due to what I eat and from the daily household work at the winter nest. While at the Bulgarian nest my eating habits changed because of the traditional life, even though I was eating slightly too much bread, but good freshly baked whole wheat bread. For a long period I was only eating one hot meal a day and the rest raw; the trick is to choose what hour of the day to eat that hot meal, I found that around 1400 was best that would kick off the afternoon nap. Mostly everyday after 1800 I would eat raw for the evening. It is a good process to change the digestion to accept more raw foods, now my body craves raw food everyday, and I am having only one hot meal day. Yet, it is always a toss up to eat meat next to carbs. Carbohydrates, such as potatoes, pasta, breads causes my system to crash, so sometimes meat is better, and even over cheese, at least for my system. 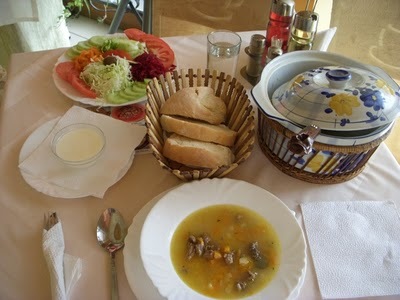 My hot meal for the day was Veal Soup with a plate of vegetables, of course. 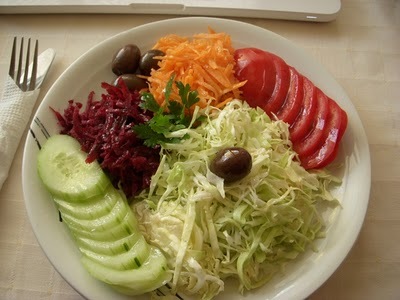 Eating Raw is cheap on the road, I can go into a fancy table cloth restaurant and get a large bowl of fresh salad of shredded cabbage, carrots, maybe some raw beats, and whatever else and the cost is only $2.00. Also, even if there is no kitchen I can buy some grapefruit, oranges, tomatoes, and peppers, cut them up with my pocket knife and be satisfied and energetic. Raw food is really the way to go when on the road. Right now the Cherries are in Season and I am buying them by the Kilo. 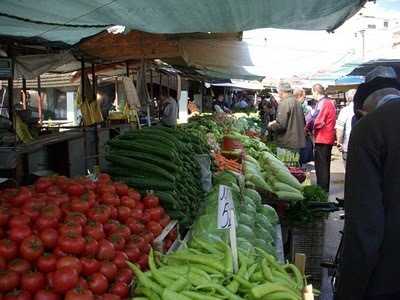 The Old Bazaar in Bitola is a Raw Food Paradise. My tolerance has also increased greatly. There are several common complaints that many one-year travelers express. Many refer to wearing the same clothes for more than couple of days, pesky bugs, and other circumstances that westerners are non-accustomed. There is a way to wear the same clothes for a week or longer and still remain clean. I am a clean person, but at the Bulgarian nest I had no washer, I did wash clothes when the weather broke, but for the most part washing clothes from the cold water well in the winter is impossible. I would wear my comfy house fleece clothes and then have a pair of clothes for when I went into town and it work out fine. Now if I go ten days I am not even bothered with wearing the same clothes. I did bring my ultra comfy fleece trousers with and they are a major comfort when inside any hotel/hostel room. I am using the same system with my pack and it seems to work the best. One thing for any traveler is to figure out a system that works and stick with the arrangement. And, blogging is easier because of the routine I use, but I must take time each week to do research and write up one or two posts for my very busy blog of Advent of Deception; the writing is very different than this casual travel blog and more time-consuming. Remaining in the moment is the most important aspect that has increased in context. Even though one bus ride might be difficult and uncomfortable, such as traveling on the packed bus from Negotino to Prilep with my backpack on my lap—yet, that moment will pass, or the next hour you might be getting rained on in the cold, or enjoying a hot bath. Therefore, the trick is not to attach to any results of the moment and just accept the situation because the situation will change. Here is an article from the Pioneer Press in Minneapolis of a guy from Stillwater that has traveled every country except 3; take close notice how the article projects a level of falsehood and fear. The media thrives hog wash stories that will implant a certain perception within the reader, and because of the high numbers an audience is attracted. Don’t take this wrong, it is commendable that a person can travel all the countries in the world, but it is the message that produces a dubious perception. Here is a guy that spends $200,000, only stays in each city for 3 days, only visits cities because he is too fearful to travel rural areas from a preconceived idea that diseases exist. He only eats standard American food at the hotels or MacDonalds, this alone should convey to the reader of the covert reality of fear within this individuals emotional reality of travel despite traveling all the countries of the world. This story is one complete joke that supports the travel industry and will only enhance the fear of Americans to travel to undiscovered areas of the world. His travels began in 1974 and will consume a total of only a year and a half and $200.000. And this is what makes a news article. One thing that everyone needs to comprehend, and especially Americans is that traveling nowadays is easy, most places around the world are safe, and most food around the world is safe to eat. There are not as many diseases in different countries as the media projects.